Exploring nature with kids doesn’t have to mean hitting the trail, heading to the mountains or going camping (though those are all fine ideas). Connecting with nature is as easy as heading out the back door. I hope this blog will give you some ideas to make exploring nature in your backyard simple and fun. And don’t worry if your backyard is tiny or even nonexistent – the ideas I share can be enjoyed at a local park or any other natural area in your neighborhood. How can I search your archives for more great backyard nature fun? I’m glad you asked! The best place to start is back on the home page, where you’ll find the Backyard Nature Fun posts sorted by season (look right under the blog’s logo). You can click on any of the seasons for timely play ideas. Or you might prefer to enter a term into the search bar in the top right-hand corner of the page to see what comes up. To get you started right here, I’ve featured the top three reader favorites in a variety of topic areas. Gardens, flowers and trees can be usually be found in just about any neighborhood, making them a simple way to connect with nature. Here’s where you’ll find ways for families to get outside and into nature during the holidays. I like making lists. All kinds of lists. Which is a good thing, because they seem to be pretty popular around here. 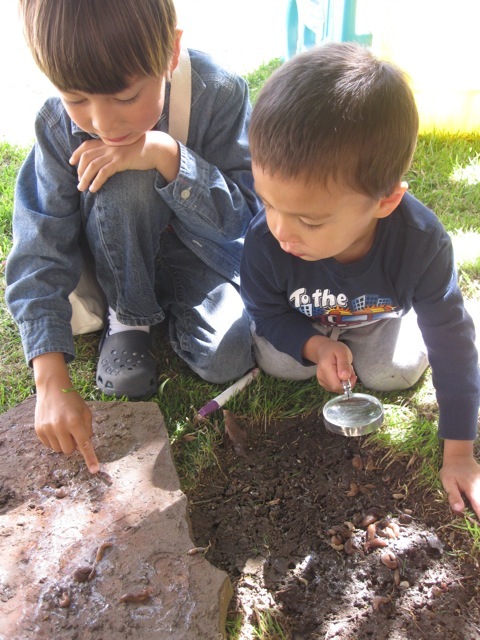 One part magic, one part imagination, this is where nature and imaginative play come together. I make no claims to be crafty, but most kids are huge fans of crafts. Thankfully, nature and crafting go together nicely. Sometimes it’s fun to explore nature when the sun goes down. See some of the activities we’ve tried. Wondering what to do when it’s pouring outside? Here you’ll find plenty of ways to turn an everyday walk around your backyard, neighborhood or local park into an adventure in nature. It doesn’t take a lot for kids to have hours of fun outside. A little dirt, a little sand and a little water will often do the trick. Winter’s snowy weather is no excuse to stay indoors. If you need some ideas for getting outside, we’ve got a few. Short on time? Sometimes connecting with nature is as simple as taking a look up. Even our urban backyard is teeming with wildlife – birds, bugs and more. 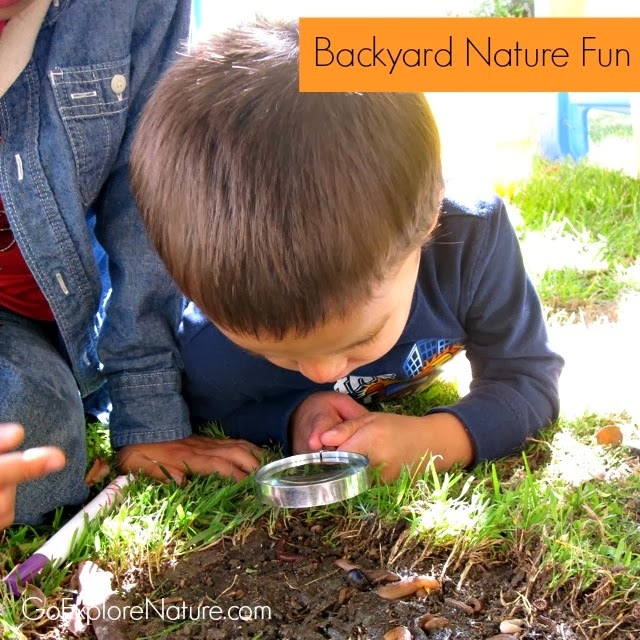 Where else I can go to see more of your Backyard Nature Fun ideas? I’m always adding new ideas to my backyard nature play spaces and outdoor play Pinterest boards, plus I have boards for nature play ideas arranged by season (winter, spring, summer and fall). I’ve also put together a fun series called 31 Days of Backyard Nature Fun that provides ideas for making time in nature a habit in just one month.